I’ve had a smoked white fish from Costco sitting in the fridge since the holidays. I thought I’d serve it for the Christmas Buffet but Googling what to do with it scared me (bones were apparently a problem) and what with shelling those four pounds of shrimp for the buffet, I never got around to the white fish. Last night after a walk with my friend Nicki, I asked her if she knew anything about this kind of fish because that was all I had to offer for dinner. Happily she did. In fact she created a whole meal for three of us. First I had R. remove the fish’s head because I was freaked out by it, and then Nicki quite expertly removed the spine and made the whole thing edible. 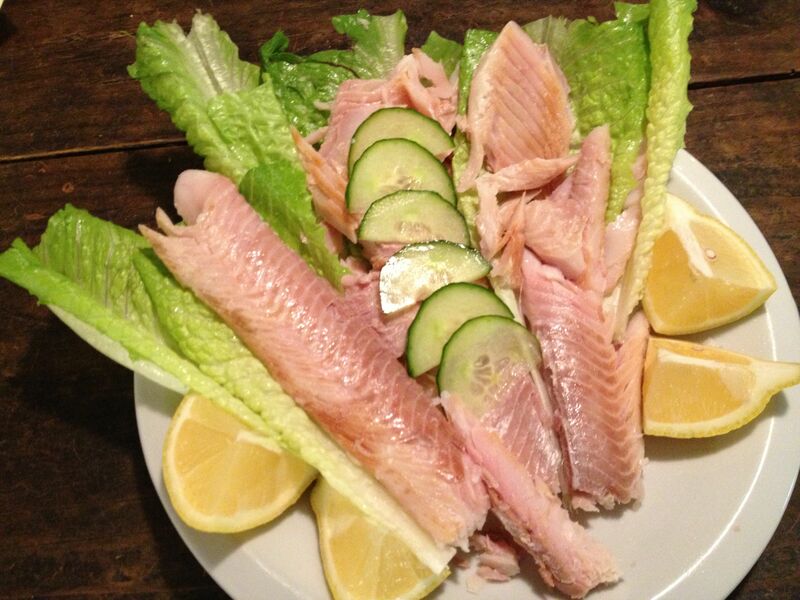 She put pieces of the fish on romaine lettuce leaves, added cucumber slices and lemon, found some horse radish, and we had a delicious and very healthful supper.